Ultra Short Throw & Universal Projector Mount with Power Conditioner is a high-performance power accessory that integrates with Chief mounts and improves the audio and video performance of projectors and flat panels. It combines the WM210AUS Ultra Short Throw and Universal Projector Mount Kit and the PX2W Power Outlet Conditioner.The WM210AUS Ultra Short Throw and Universal Projector Mount Kit include a dual stud short throw extension arm (WM210S) and the Universal Mini RPA Elite projector mount (RSMAUS) to provide good flexibility, precision, and strength. 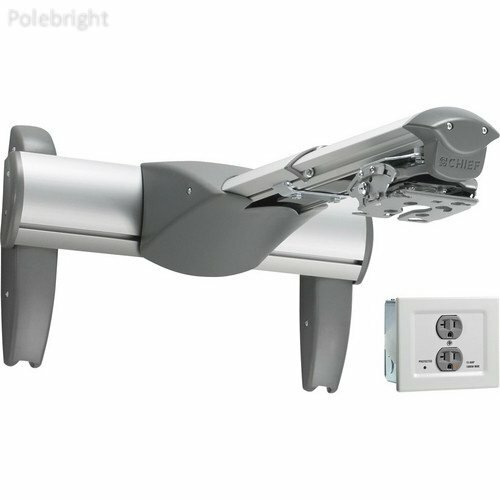 It also supports wall-mounted long-throw projectors.The PX2W Power Outlet Conditioner (Power Filtering & Surge Protection) is a high-performance power accessory that integrates with Chief mounts and improves the audio and video performance of projectors and flat panel displays.To confirm the compatibility of this mount with your projector, visit Chief's MountFinder Pro. ts120 VAC, 60 Hz, 15 A Packaging InfoPackage Weight28.8 lbBox Dimensions (LxWxH)22.25 x 13.0 x 12.0"